Hutchinson Central Christian lineman J.T. Duree wanted to achieve his longtime dream of playing college football. About halfway through his senior season, Lebo wide receiver Peyton Baldwin visualized himself playing football after high school. The 6-foot, 250-pound Duree anchored both sets of lines for the Cougars. He had some carries for the Cougars’ high-octane attack that finished 19-3 the last two years, best in school history. Duree built a relationship with the nearby staff at NAIA Sterling College. Central Christian had attend Sterling’s summer camp at Canton-Galva the last two years. Duree plays basketball and track and knew the Warrior coaches from church. Duree gave a verbal commitment to Sterling College. Emporia State made a late push. Duree’s neighbor’s grandson is one of the Hornet coordinators. The neighbor cut out articles and photos and sent them to Emporia. Around two weeks before National Signing Day, Duree went on a visit to Emporia and received an offer. Duree said ESU was impressive, though kept his verbal consent with Sterling, mainly because of his relationship with the coaching staff. “I was more comfortable with them,” he said. Baldwin lives around 30 minutes from Emporia and had attended Hornet games throughout the years. He went to Emporia State camp last summer and had planned on attending ESU. On his own, Baldwin reached out to Emporia’s coaching staff, especially assistant coach Nathan Linsey, an accomplished Hornet in his playing career and Lebo graduate. “Peyton did this 100 percent on his own, showed great maturity,” Lebo coach Troy McArthur said. At first, the 5-foot-11, 180-pound Baldwin received little communication from Emporia State. He asked the Hornets for their walk-on policy and sent Linsey his highlight video. Then, Linsey delivered an email asking for a visit. NAIA Bethel College had shown interest. Baldwin had a Bethel visit planned but never went because the Hornets offered him a walk-on spot Feb. 3 when he visited ESU. Baldwin accepted, happy to have a chance to play college football. 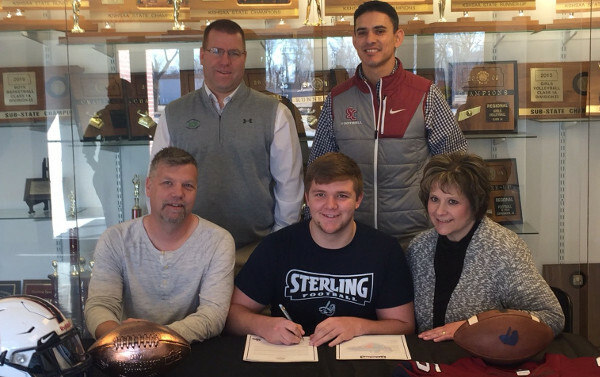 With the 2018 National Signing Day taking place earlier this month, Duree and Baldwin’s signings followed several of the eight-man trends over the last four years, namely the high number of eight-man signees going to NAIA schools (especially Sterling). Additionally, this season stayed consistent with recent trends regarding schools, position and body type. “Scholarship or not, I wanted to be a Hornet and play football, so I wasn’t going to turn it down,” Baldwin said. In the last four years, Kpreps Signing Day data lists the total number of Kansas high school signees as 238, 240, 249 and 300 this year with most notably an uptick from the NAIA schools. While Kpreps attempts to compile a list every high school football signee, it is nearly impossible to ensure an all-inclusive list. In the previous three seasons, seven, eight and seven in-state eight-man players inked on Signing Day, or three percent. This year it was 10, again three percent. Of the 22 eight-man signees in the previous three classes, 13 went to NAIA, six to junior colleges, two to Division II and one Division I. This year, the 10 signees had seven NAIA, zero junior colleges, two Division II and one Division I. “There’s a lot of quality football players out in western Kansas that play 8-man or even 6-man,” Chase Hansen, Sterling’s first-year head coach and a former Warrior assistant, said. The bulk of Kansas’ 11-man signees are primarily linemen, with 25 percent this year and 24 percent last Signing Day. The number skews a little more toward skill positions in eight-man. Of the 32 eight-man signings in the last four years, six (19 percent) are listed as linemen, including three this February. Five of the six linemen weighed at least 250 pounds and/or were six feet tall. That included Lebo’s Bryan Gilmore, who signed with Bethel at 6-foot, 275 pounds in ’15 and remains on the Thresher roster. Twenty-four of the 32 eight-man signings were at least 6-foot and 18 weighed 200 pounds. This year, Sterling collected three pickups with Duree, Ingalls lineman Zach Barrie (5-10, 250) and Ness City running back/linebaker Brennan Chacon (5-10, 215). NAIA member Concordia (Neb.) had zero Kansas players in ’14-15 before signing one in ’16, three last season, and seven this year. Two were eight-man players: Lakeside defensive back Drew Cunningham and Tescott linebacker Logan Srna. Also in NAIA, Kansas Wesleyan collected defensive end Andrew Capsey from nearby Solomon, while 6-foot-7 wide receiver Caiden Musick (Burlingame) signed with Southwestern College. Linebacker Freeman Greene of Cair Paravel, a Kansas Christian Athletic Association (KCAA) eight-man program, committed to Division II Washburn, and the aforementioned Baldwin chose the ESU walk-on offer. “He loves the game, he is a heck of a competitor, and he is going to work hard, and he is going to eventually going to see himself on the field,” McArthur said. Hanover lineman Carlos Emanuel, Eight-Man, Division II’s Defensive Player of the Year and a Shrine Bowl selection, had received plenty of interest with his size (6-4, 305). Emanuel was consistently linked to Kansas State and will be a preferred walk-on for the Wildcats. Central Christian’s Elias Butterfield, an all-state wide receiver in 2016, had originally committed to Sterling for last year. But his mother passed away shortly after she watched him play in the eight-man all-star game last June. Smith said Butterfield will play for Sterling starting this fall. Several of the other top eight-man players continue to weigh options. St. Francis’ electrifying multi-sport athlete Tate Busse has received interest in multiple sports, confirmed Indian coach Rodney Yates. Fellow Sainty standouts Trayton Doyle and Dalton Straub have had Division II interest. The trio is all at least 6-2, while Doyle (a premier eight-man lineman) was listed at 230 pounds. Spearville running back Bailey Sites, an elite eight-man player that averaged 10.7 yards every time he touched the ball in his career, signed with NAIA member McPherson College. In an effort to bolster interest, Burlingame coach Jeff Slater has posted achievements of his team and players on Twitter and received contact from several new coaches and schools. Duree has talked to Central Christian’s Nate Heneha, an all-state quarterback and basketball player, about signing with Sterling. Smith confirmed Heneha has received interest from McPherson College for basketball. “He can play both for sure if the college would allow him to do that,” Smith said. Sterling has had long-standing connections to the small schools. Andy and Chuck Lambert – who stepped aside as head coach shortly after last season to pursue a pastoral position – both came from Smith Center. “They appreciate it, and they know that there’s good kids there,” Smith said. One of Hansen’s best friends is Weskan coach Brett Clow. Sterling has multiple graduates in the coaching ranks, most notably Matt Fowler, who was recently announced as the new head coach at Oswego after a highly successful stint at Spearville. Multiple eight-man players have enjoyed success at several collegiate levels in the last several years. West Elk’s Isaiah Loudermik (6-7, 277) has easily been the top eight-man recruit in recent history. Last fall, he played in 11 games for Wisconsin as a redshirt freshman and recorded 11 tackles with 1.5 sacks. Earlier this decade, Baileyville B&B’s Cody Heiman and Madison’s Kole Schankie were standout linebackers at Washburn and Emporia State, respectively. Nathan Frame, a former quarterback at Kinsley, played backup quarterback, H-back and slot receiver for Sterling. As a senior two years ago, Frame earned first team all-conference after an 11-touchdown season. Koltyn Ratliff was the starting quarterback for a 13-0 Ness City squad. He went to Sterling, played outside linebacker and was honorable mention all-league last season as a senior. Last fall, when Duree went to Sterling games, he enjoyed seeing former eight-man players on the Warrior roster. Currently, Sterling features South Barber’s Grant Cantrell, Triplains-Brewster’s Jaden Schmidt, Burrton’s Daniel Bingham and Atwood’s Will Ginther from eight-man programs. FHSU has received two big seasons from Central Plains’ wide receiver Layne Bieberle, a 2015 commit and Shrine Bowler. In his career, has 71 catches and nine scores. Marais des Cygnes Valley tight end Matt Jones, son of former Lebo/MdCV coach Butch Jones, was a first team all-league player at Butler County. Jones (6-5, 237) was listed as a redshirt junior on Kansas State’s roster last fall. This year, FHSU signed one eight-man player, Gerald Morehead of South Central. Morehead transferred from Dodge City Community College after one semester. “Bieberle is one of those guys as well - if it’s a kid that can actually dominate the field continuously play after play and game after game, you know he’s a pretty good football player,” Fort Hays coach Chris Brown said.